When I was around three years old my mother would load me and my baby sister into the green Pontiac at our home in Nabnassett, and point the car south to New Jersey. I remember those road trips. Driving along the back roads out of Westford, and south till we got to the Mass Turnpike. The Pike was brand new back then and it was all the rage. People would actually just take a Sunday drive on the that highway. 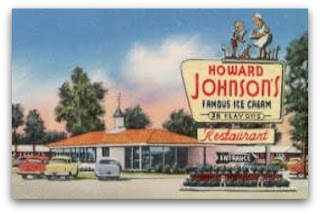 They'd stop at the travel plazas along t their way, maybe grab a meal for the family, or just some ice cream from the 28 flavors at Howard Johnsons, and when they were done, they'd find the next exit, turn around and head back home. For me, I got all excited when I saw that orange roof that stood out like beacon on the highway. Clam strips, that's all I wanted was clam strips, a little cup of cole slaw, and some fries. This orange topped palace had it all. Those highway meals became my on-the-road comfort food over the years. Just the sight of an old HoJo's and that orange roof would get me all nostalgic for that simpler time. The restaurants themselves were state of the art back in the 1950's. Most looked just like the ones in the photos above. Through the main door, and once inside you would had a choice of the lunch counter with chrome columned stools to the right, or the dining room, to the left ,with a couple of dozen vinyl glad booths and large bright windows on two sides. The waitresses uniforms were always the same, a light blue covered by a ruffled full apron, and of course, the name pin. When I stumbled on the postcard at the top of the page, it brought back a suitcase full of road trip memories. The restaurant is so familiar, in fact, the car parked out front looks just like our old Pontiac. That old restaurant in Sturbridge is long gone. Once the cutting edge of food service on the American highway, they are very few in number today. Click on the link in the caption above to view the site of the old Sturbridge HoJo's as it looks today. Nothing is forever. Somethings are tossed aside. They used to call it progress. I'm not sure that is what we'd call it today. The Sturbridge, Massachusetts Howard Johnson's around 1957. 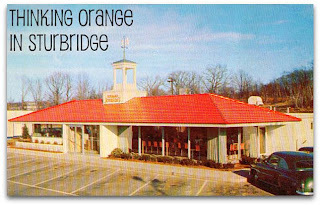 Wasn’t this Howard Johnson’s actually in Holland on old rte 15? The HoJo's was in Sturbridge on Old Route 15 at the southwest part of town. If you drive along 15 you can see the vacant lot, and abandoned parking lot on the right a short ways before you come to the road that takes you to either Union, CT, or Holland, MA.